Opening times Mon–Fri 10.30am–3.45pm. Closed Sat/Sun. Kitchen garden shop selling fruit and vegetables grown on site by trainees. Open during the week but closed in winter. This inspiring kitchen garden owes much to the energy and vision of the founders and the generous rent-free land donated by the trustees of Hospitalfield House. A large variety of vegetables and fruits are grown outside and in polytunnels by the trainees – adults with learning difficulties. Everything is grown organically and it is possible to buy the produce straight from the garden. 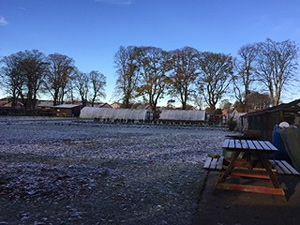 The shop's open during the week (but shuts up for winter), selling tools as well as produce and creating another social and educational opportunity to add to the horticultural experience for the trainees. The Hospitalfield Organic Produce Enterprise by Arbroath is reaping the rewards of its successful community gardening project.